The coastline appears where the sea meets the land, but it is not just a line in the landscape. It is home to living organisms engaged in a fierce battle for survival between the tides, struggling by turns with heat and dryness followed by rough pounding waves. At the same time it is a fertile space where light mixes with water, air, and a host of microorganisms. Here on the border of sea and land they have blossomed into myriad unique forms. Many millions of years ago our ancestors also emerged from the ocean across this border. There is another coastline, where the bit meets the atom. Now we are preparing to cross this coastline between the "land" of the physical world (atoms) and the "sea" of digital information (bits). But this is no easy crossing. Our visual and auditory sense organs are steeped in the sea of digital information, but our bodies remain imprisoned in the physical world. Bombarded by waves of bits emitted from hundreds and thousands of computer screens we are losing the sense of our bodies and the spaces we inhabit. Able to breathe only through our lungs we clutch the plastic mouse and begin to drown in the flood of pixels gushing out of ubiquitous square screens. In a time far distant from this age when architectural space is buried under photons flowing out of computer screens, our ancestors inhabited a space conceived on the model of perspective that was continuous with the body. But today, on the other side of the countless screens which fracture our space, there extends a strange, discontinuous space composed of infinitely hyperlinked bit fragments. It is dizzying to behold, like a cubist painting. In this space, one has no sense of one's own body, nor are there traces of the bodies of those who have passed through it. All we see are dry, clean bits beyond the glass like rows of artificial light. The key idea of "Tangible Bits" is to "give physical form to digital information," and thereby to "make bits directly manipulable with our hands, and enable environmental recognition of information on the periphery of consciousness." This digital information has been sunk deep below the water with only its indistinct shadow visible on the surface. But by pulling it back up into the world above the water's surface, into the air that we breathe, we will be able to touch it directly and confirm its existence. Then, by fusing this materialized information into architectural spaces existing in social context, it will be possible to transform architectural space itself into an interface between human beings and the world of digital information. This is the dream of Tangible Bits. In this presentation, I am going to introduce the iterative design process done by myself and the members of the Tangible Media Group in pursuit of this vision. These works were created neither as pieces of art aspiring after aesthetic value nor as technological demos meant to solve practical problems. Rather, as media meant to explore the concept of Tangible Bits, they were designed as intellectual tools to keep us asking questions no one has ever asked before. In the end the completed works do have a certain technical utility and some artistic aspects, but they were not created in order to bridge the enormous gap between art and technology. The goal of our research is the creation of new concepts and vision. We employ the latest digital technology and industrial design methods as a means of visualizing and examining those concepts. Tangible Bits is like a pair of eyeglasses meant to help people see what would otherwise remain invisible. We invite you to put on these conceptual eyeglasses and see the world in a new perspective. These eyeglasses should help you to see everyday objects and architectural spaces in a new way, as "interfaces with the digital world." We invite you to experience a new and yet somehow familiar sense of what an interface should be, something different from clicking on the plastic mouse, something which gestures toward a new relation between information and ourselves. 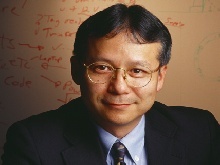 Hiroshi Ishii is a tenured Associate Professor of Media Arts and Sciences, at the MIT Media Lab. He co-directs Things That Think (TTT) consortium and directs Tangible Media Group. Hiroshi Ishii's research focuses upon the design of seamless interfaces between humans, digital information, and the physical environment. At the MIT Media Lab, he founded and directs the Tangible Media Group pursuing a new vision of Human Computer Interaction (HCI): "Tangible Bits." His team seeks to change the "painted bits" of GUIs to "tangible bits" by giving physical form to digital information. Ishii and his students have presented their vision of "Tangible Bits" at a variety of academic, industrial design, and artistic venues (including ACM SIGCHI, ACM SIGGRAPH, Industrial Design Society of America, Ars Electronica, Centre Pompidou, Victoria and Albert Museum), emphasizing that the development of tangible interfaces requires the rigor of both scientific and artistic review. A display of many of the group's projects took place at the NTT InterCommunication Center (ICC) in Tokyo in summer 2000. A new, three-year-long exhibition "Get in Touch" that features the Tangible Media group's work opened at Ars Electronica Center (Linz, Austria) in September 2001.